I’ve been finding myself drawn to the Globalweave Sheer Linen as of late. I love its subtle but interesting colors and its lovely tweedy texture. Another great thing about it is how it frays. With most fabrics you want to avoid fraying but with this one the fraying just adds to its beauty. I was playing around with it one day and made some simple flower shapes which had simply been cut and not finished and I loved the way they looked. 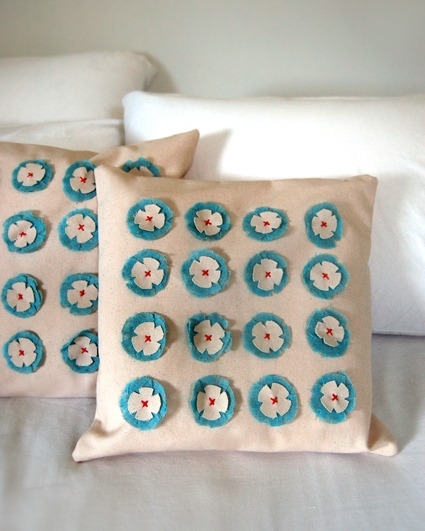 It seemed like a set of pillows would be the perfect canvas to display this new idea. There are few easier and yet more satisfying sewing projects than throw pillows. They are a simple opportunity to add something special to any room and a great way to try out new techniques and fabrics. For these particular pillows I used the wonderful Carr Textiles Organic Cotton Duck in the Natural color as the base of the pillow and center of the flowers. 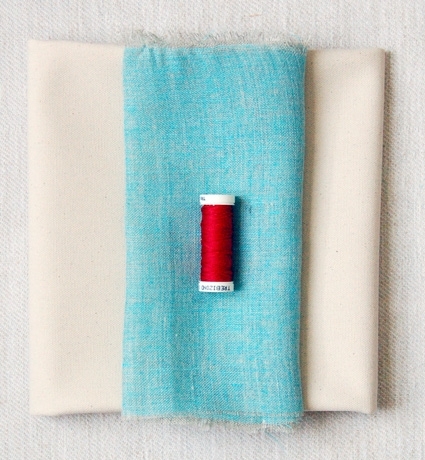 This fabric was made for heavy duty applications like upholstery and I love the way it contrasts with the delicate light blue linen. To add another note of contrast I sewed the flowers on with bright red Trebizond Silk Embroidery Thread. In addition to the color the shine of the silk is a nice juxtaposition with more restrained Cotton Duck. These pillows are a total breeze to make and are finished with a simple overlap closure so they can be hand washed making them both beautiful and practical. 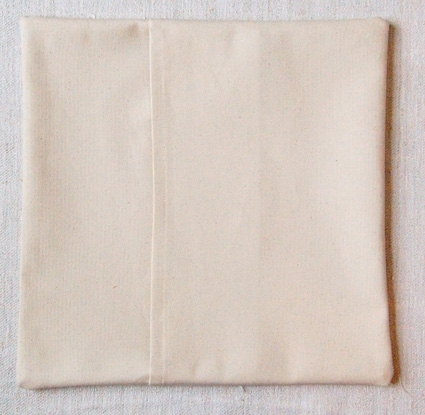 Fold one of the long sides of the rectangular Cotton Duck pieces over a 1/2-inch twice thus hiding their raw edges. Press and pin this fold down. 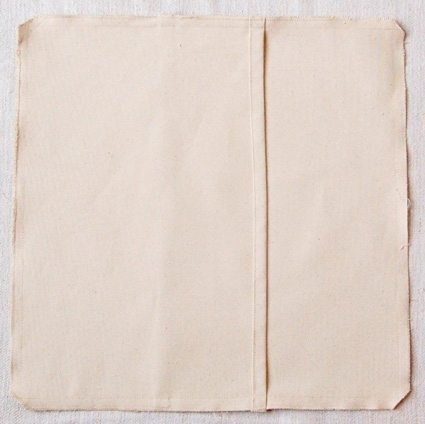 Sew the fold down with a scant 1/2-inch seam allowance just at the edge of the fold. Do this for one long side of both rectangular pieces. The side with the fold is now the wrong side of the piece. 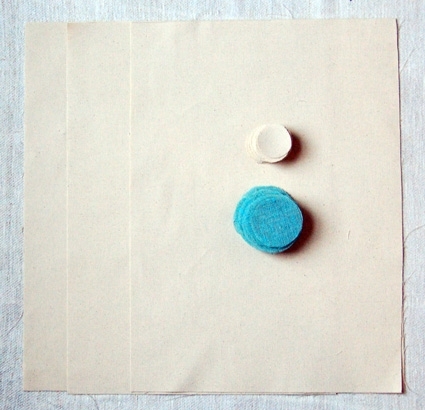 Place the square piece of Cotton Duck down smoothly. On top of that place one of the rectangles wrong side up along the left side of the square with their 15 1/2-inch raw edges meeting up and the fold on the inside of the square. Place the second rectangle on top of the first two pieces wrong side up along the right raw edges of the square. Pin all three pieces together in this orientation. 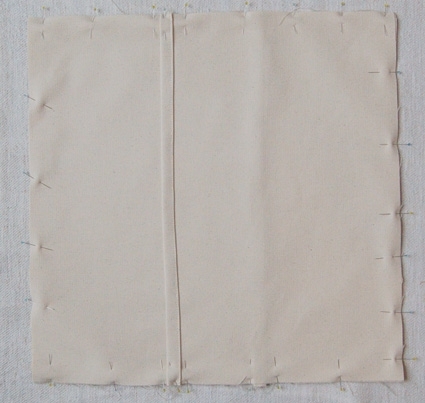 Sew around all four sides of the square with a 1/2-inch seam allowance backstitching at the beginning and end of the seams. Clip the corners and then zig zag stitch along the edge of all four sides to finish the seam. Turn the pillow right side out. The back should look like this, with a neat overlap closure. 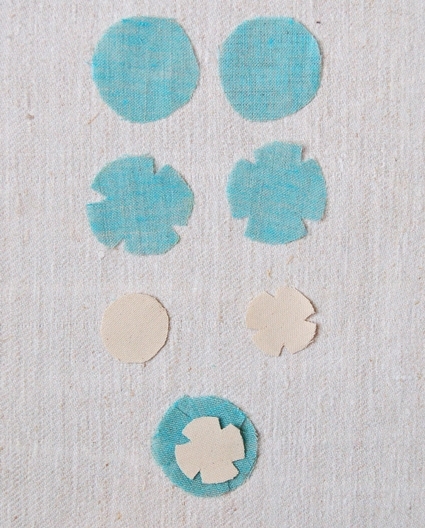 To form the flowers cut roughly 1/4-inch notches at 12:00, 3:00, 6:00, and 9:00 along each of the cut flower templates. These notches do not have to be exactly the same on every circle irregularity will only add to the charm. Place two of the notched Outer Flower circles on top of one another, rotating them so that they cover each other’s notches. 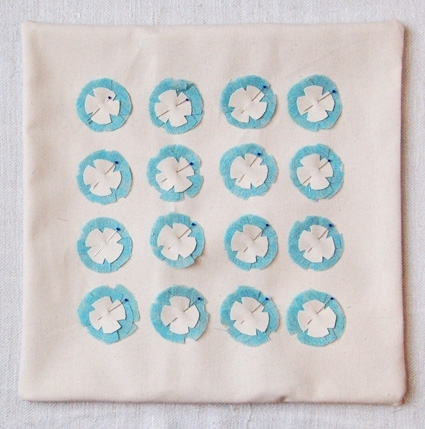 Place a notched Inner Flower circle in the center of the Outer Flower circles to form the final flower shape. 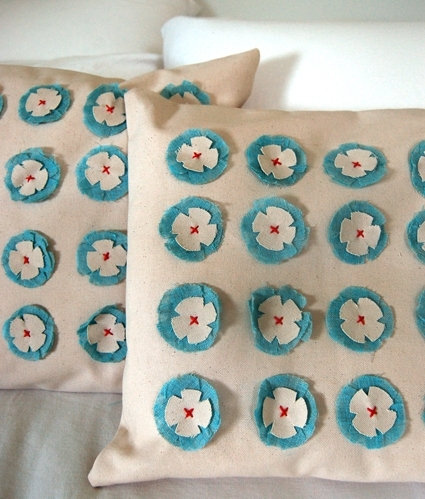 The flowers are pinned and sewn on after the pillow is sewn because it’s much easier to get them placed correctly. 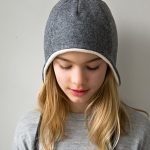 That means that you will have to be extra careful not to pin or sew through anything but the top layer of the pillow. 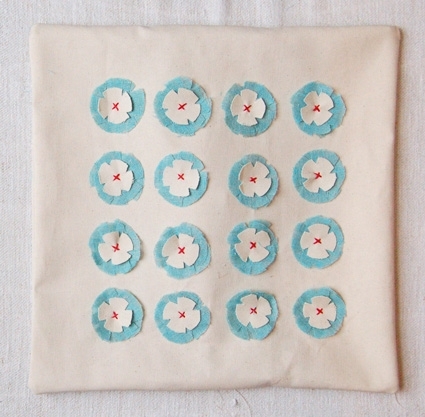 Form 16 of the flowers and pin them in a neat square formation to the front panel of the pillow, 2-inches from the pillows edges. I found it easiest to measure the 2-inch perimeter and then arrange the flowers by eye rather than graphing out everything out mathematically. Make sure you are pinning only through the front of the pillow and not to the back panels. Using the Trebizond silk thread sew the flowers on with cross stitch through their centers. 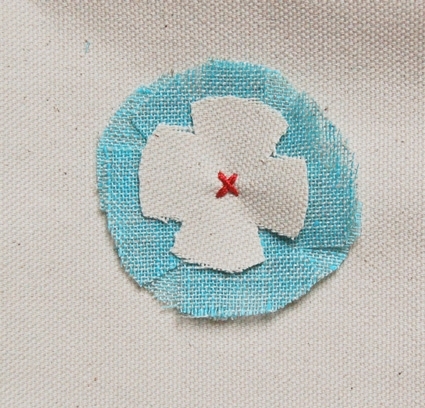 Go over this cross twice to make sure they are sewn on securely. Again make sure you are only sewing through the top panel. 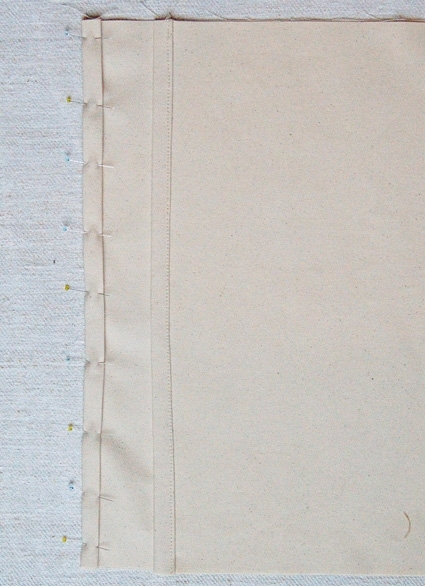 You will have to sew with your bottom hand placed through the overlap closure inside the pillow . Sew on all the flowers in this manner and you’re all done. Repeat all of the steps for the second pillow and then stuff them with the pillow forms. These cushions are gorgeous! What a lovely idea! So simple yet so cool! Sorry to hear that you're having problems downloading the template. It seems to be working for me so rather than trouble shooting I am going to go ahead and email it to you now. Love the pillows! we just ordered new living room furniture Ivory and red with this same blue green as accents! 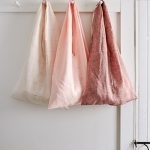 I can not wait to make these for my new room! I love these. Such a pretty effect.